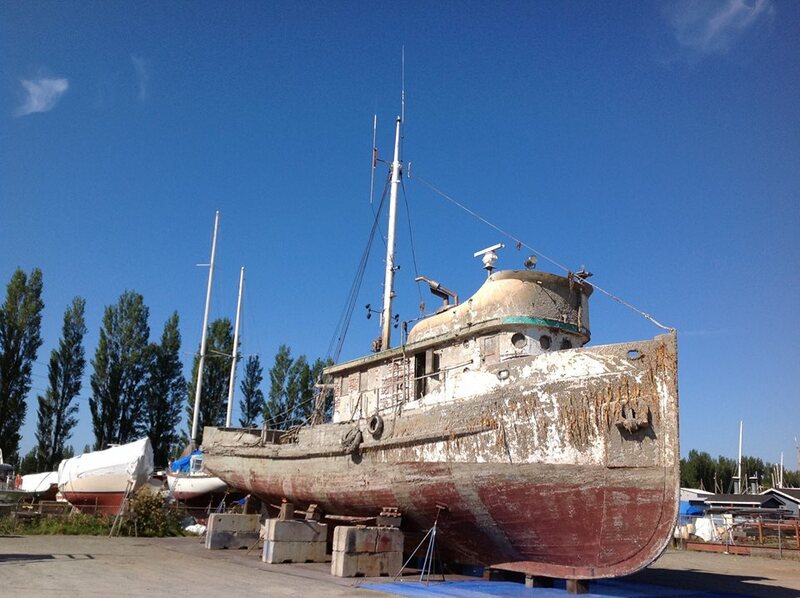 The Western Flyer in a Port Townsend boatyard, photo by Anne Shaffer of the Coastal Watershed Institute. Kevin Bailey has an update on the Western Flyer. It sank last January and was raised again on July 5. It was towed to Pt. Townsend. Work has begun to dismantle the boat. The deckhouse will be taken off and shipped to Salinas to become part of the owner’s restaurant. The project manager is one of the former owners of the boat. Another powerful strand in this web are the boats, especially those that linked with both the fishermen and the scientists. The most important of all might have been the Western Flyer, chartered out of Monterey for $2,500 in 1940, headed to a research cruise on the Sea of Cortez. On board were John Steinbeck and his good friend Ed Ricketts, for a six week research cruise to the Sea of Cortez, writing the book that would become The Log from the Sea of Cortez, published in 1951. The history of fishing off this Pacific coast is rich and powerful. Dynamic entrepreneurs, fine scientists, and boats that deserve to live on, at least in memory, and maybe also in restaurant foyers. This entry was posted in California sardines, Carmel Finley, Charles Gilbert, Dayton Lee Alverson, Environmental History, George Moskovita, History of Science, History of Technology, Maritime History, Ocean fishing, Pacific Fishing History Project, World History and tagged Ed Ricketts, John Steinbeck, Log From the Sea of Cortez, Western Flyer. Bookmark the permalink.